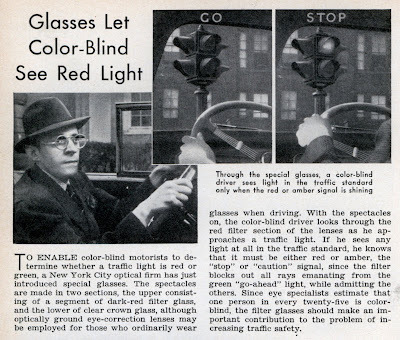 Apparently the problem was solved decades ago with the introduction of colorblind glasses. It's simple, really. As the article points out, the glasses block all green light from entering the eyes. Therefore, a colorblind driver knows that if he sees any light, it must be either red or yellow. Yikes. Now, instead of a driver having some color confusion as he enters an intersection, he has true color blindess. Hopefully the vehicle in front of him isn't green. This doesn't even get into issues like bulbs being burned out or other signal failures. Luckily these didn't take off, and we're left to search for additional creative ways to help colorblind drivers navigate our roads. The headline and the photos tell one story, but the text of the article tells another. I have been driving for two years using the idea described in this article (developed independently, but executed the same way as above). The trick (not described in the article) is to nod your head ever so slightly to bring the traffic light into and out of the filter. When done this way, the green light will disappear when looked at through the filter in the upper half of the spectacles and reappear when seen through the lower, clear half. The red or yellow light will simply remain unaltered. The upshot is that nodding your head up and down a few quick times provides a flashing green light and a steady red one. This is very easy to do and does not cause any disorientation. Try this right now: Look at an object several feet away. Now, while keeping your focus on the object, nod your head in a “yes” motion. Did you get disoriented? I think not. Using this technique, I can determine the color of a traffic light much farther away than I can determine its position, especially at night when the outline of the traffic signal is not obvious. Horizontal traffic lights would also work with this technique. Now that I’m used to doing this, I would not want to drive without the special filter glasses. Before reading the next paragraph, a word of caution: trying this while driving could be dangerous. If you look through the filter too much of the time, green lights will disappear and that’s not a good thing. Just see Brian’s original “Yikes” commentary. Take it slow, as I did, and don’t go forward unless you feel like the risk/benefit ratio is on your side (as I do). If you are interested in trying this yourself, get a pair of the old Red/Green 3D movie glasses (you can still find them online) and use the red-looking lens/film to be your green light filter. Before you build a pair of glasses like this, you can experiment by moving this filter in front of and away from your eye. If you have the correct filter the green traffic light will appear and disappear as you remove the filter, then place it back in front of your eye, respectively. If you want to take if further and build a pair of glasses, get the Rosco “Roscolux 19 Fire” color filter film. It’s the best of many that I tried for blocking the green light while leaving the red and yellow alone. Perhaps others will find this useful, or better yet, evolve the idea further. How about a smartphone app that identifies traffic lights, turns the green into a fast flash, the red into a slow flash or communicates the information is some other fashion. The self-driving car can figure this out, perhaps an app can do it too. Have fun.